When you need a quiet place to record voiceovers or musical instruments, the Voice Over booth at Full Moon & High Tide Studios is ideal. A high quality Neumann TLM-103 condenser microphone makes everything sound good. A tube microphone preamplifier is located in the booth, close to the mic for the highest quality. 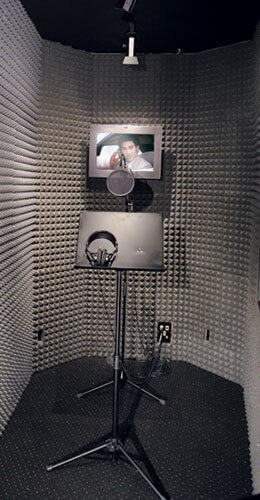 The sound from the mic can be patched to any suite for your convenience. The dedicated 20” LCD monitor can show images from any suite or VTR and from the control room. Narration to picture is a snap.